This week, on 22nd & 23rd of March, Pitchford heard arguments around how much secrecy there should be at the Public Inquiry into Undercover Policing. Full transcripts of the day one and day two are available. The hearing started with a lively demonstration outside the court, with singing and chanting about stopping secrecy, the police’s policy of ‘Neither Confirm nor Deny’, and asking the courts to release the cover names of the Undercover officers. The court then filled up, and over flowed, with public and core-participants wanting to witness the process of the Public Inquiry. The two days saw the barristers representing different parties involved in the Inquiry speak. Pitchford, the judge presiding over the Inquiry, started by saying how important the hearing was, and the impact it would have on the whole Inquiry. The Metropolitan Police were represented by a barrister who argued that it is wrong to decide the level of secrecy on widespread public or ministerial concern, and that the overriding public interest was in protecting the undercover police and their methods. He faltered when questioned by Pitchford about how the secrecy they were asking for would actually work. Barristers for the National Crime Agency and the Secretary of State for the Home Office also spoke. 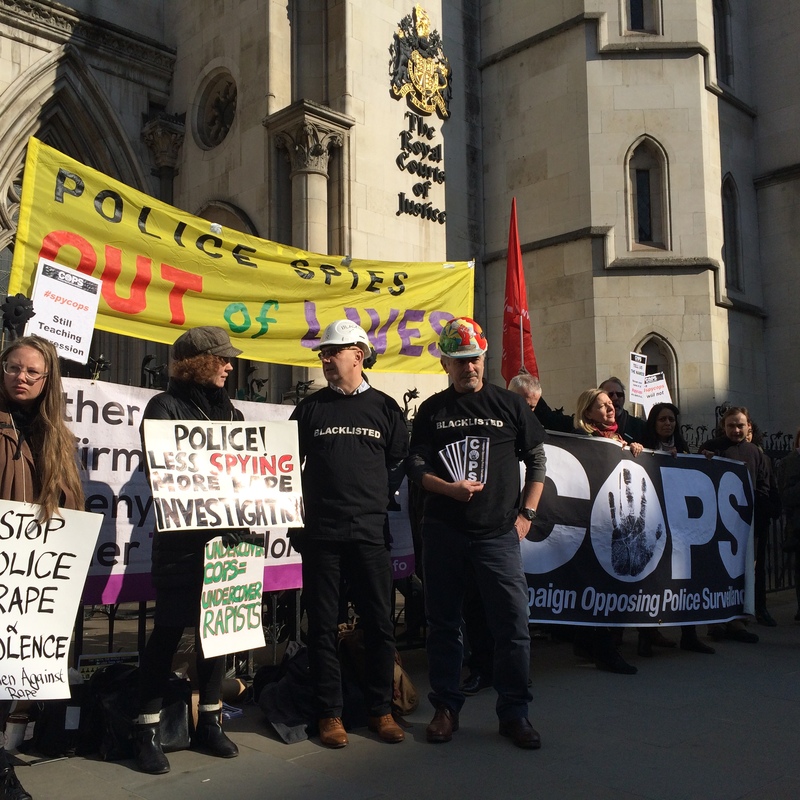 Phillipa Kaufman QC represented the 150-200 non-state core participants in the Inquiry who are victims of undercover policing, including the women we support. Kauffman delivered a barrage of impressive points, saying all victims have a pressing need to know what happened to them and whether it was institutionally sanctioned. She said it was clear that the Inquiry could not rely on the Police self-disclosing, and that unless the cover names of officers were released, the victims could not come forward to give evidence on the abuse. She talked about the extensive public interests against secrecy, including accountability of the Police, the rule of law, and fulfilling the terms of reference of the Inquiry. Squires QC represents Elected Representatives who have been spied on by undercover police. These include Ken Livingstone, and Jeremey Corbyn. He put to the hearing that these people were spied on because they were left wing. He said this was incompatible with democracy, and must be brought to light, as it is crucial the police are seen to be politically neutral and democratically accountable. He called for the release of the cover names, and stated that MPs had been promised they would be told who was targeted and why. Peter Francis, former undercover cop and whistle blower was also in court, represented by a barrister. The hearing was told that Francis wants to expose unethical, unlawful undercover policing practices, contrary to rule of law. Francis believes that cover name exposure would not imperil the safety of the officers or their family saying he himself feels at no risk. He said that he had never been promised lifelong confidentiality or been told about a policy of NCND. Interestingly, he also said that the techniques that the Police argue need to be protected were not sophisticated, and are already largely known about. He said the failure to reveal spy cover names would shield from public scrutiny the exact thing the inquiry was set up to examine. The media were also represented, and they asked for Pitchford to allow their right to report on the Inquiry, and to continue their work to expose wrong doing. Helen Steel was the only core participant to represent herself, and her powerful statement got a huge round of applause from the public gallery. She cut through the legal speak, shattered the police’s arguments around NCND (exposing it as a policy developed to protect them during the recent courtcase), and argued that victim’s had a right to know what had happened to it – no one should have to wait 24 years to hear the truth as she had. Pitchford has now retired to deliberate on the decision, which he will not announce until April.